What Happens When A Starbuck Pumpkin Spice Latte Collides With Bread Pudding? 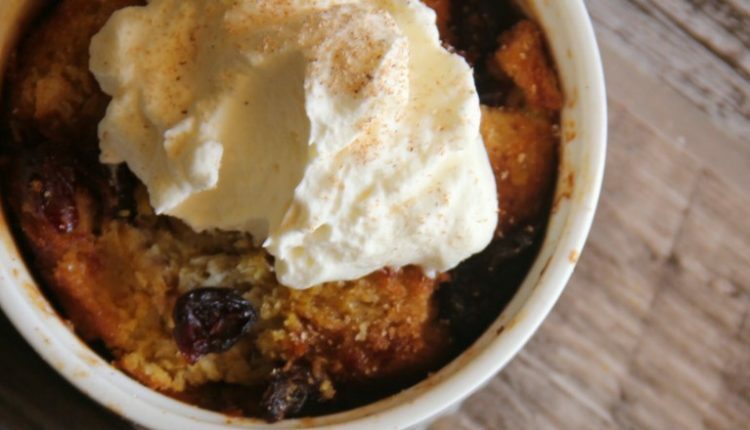 I hadn’t really planned to make a pumpkin bread pudding, but sometimes when you are trying something new and using the ingredients on hand you just stumble across something absolutely mind boggling. That is what happened with this recipe. I had just made some pumpkin muffins the week before and had a half of a large can of pumpkin puree left in the fridge. I also had a loaf of bread that was starting to get a little stale so instead of just chucking it, I made some bread pudding. Pumpkin bread pudding! It was such a huge hit my family asked me to make it again. This time we had company over and they wanted to know if I would be willing to share the recipe. Yikes! I didn’t even know exactly what the recipe was so I made it again and this time wrote everything down. Basically, if you have what you need for a pumpkin pie plus some bread you have what you need for this comfort food. And trust me, I have even used day old French baguettes and they worked just fine. Which I think is one of the beautiful aspects about bread pudding. It is simple and resourceful. Quick Tip: I love making individual desserts when company comes over. You can divide this into small ramekins or even small wide mouthed canning jars. For smaller jars you might want to put filled jars or ramekins on a tray and add in ½ inch water to keep from drying out. All The Pumpkin Flavor Without Turning On The Oven?